While walking into a stark, industrial room, you can see how the works of art on the white walls make them alive with color and warmth. The huge pieces of art made of collages, comics, and array of paints caught my eye the moment I walked in. The Bradford exhibit, “New Works,” was open from February to May at the Hauser and Wirth museum located in the historic Arts District of downtown Los Angeles. Bradford was born in Los Angeles and continues to live and work there. This is the first time in 15 years that he has had a gallery exhibition in Los Angeles. Bradford is one of the most influential and significant artists of his generation. He is known for using comics, magazines, billboards, posters, endpapers, and newsprint to combine political and cultural ideas that create social commentary and deep emotions. 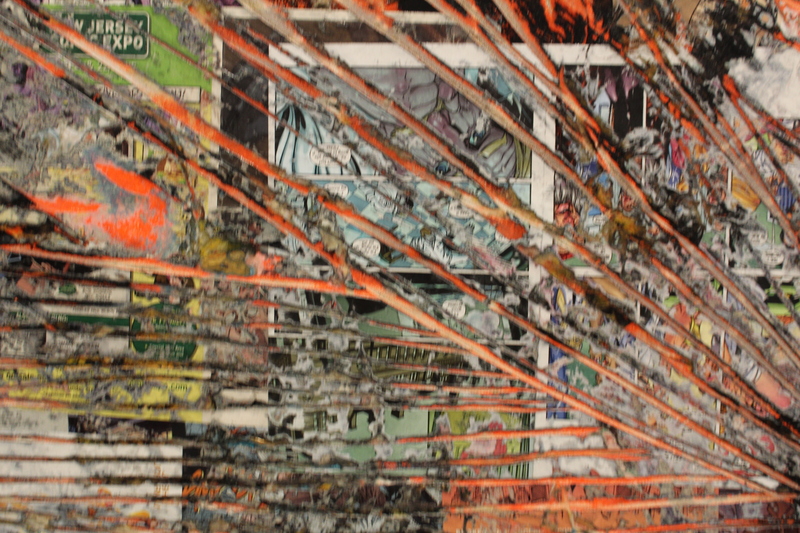 The exhibit featured 10 of Bradford’s newest works using comic books that are hidden throughout his abstract works. He uses the stories and pictures in comic books to question the influence of the media on contemporary society. Bradford also addresses the misconceptions of black identity, gender, homophobia, and racism. Many of Bradford’s works are uniquely titled after key phrases found in the speech bubbles of comic panels. For example, “Tonight….we feed” and “I heard you got arrested today” are only two of his most famous titles. Another work is titled “Moody Blues for Jack Whitten” which is composed of shades of blue and rhythmic lines for his friend and inspiration, Jack Whitten. Another remarkable aspect of Bradford’s works is the size of each work. They range from 59 inches by 59 inches to 120 inches by 120 inches. Viewers can appreciate the beauty of the work from a distance, but when they come closer they can see the how the comic books are woven throughout and find a new perspective. Hauser and Wirth is a Swiss art gallery that features modern art. The Los Angeles location opened in March 2016. The industrial space includes a public garden, an open air courtyard, galleries, a bookstore, courtyard chickens, and a restaurant called Manuela which uses locally sourced food from its garden. Bradford has had several exhibits around the world from London to Washington to Los Angeles and we are looking forward to seeing what he does and where he goes next.